An ammonia leak in Round Rock, Texas brought hazmat crews to a local food plant. Michael Angelo’s, a company that produces frozen Italian food and bottled sauces, was subject to an ammonia leak on Saturday. The ammonia, used as a refrigerant, escaped from a large tank into a containment area, but strong fumes escaped into the building, resulting into the evacuation of about 20 employees. Proper hazardous waste containers are crucial to the health and safety not only to working personnel, but to the community. The ammonia fumes were so overwhelming that nearby residential areas were ordered to close their windows and air conditioning units. Some residents were unable to gain access to their neighborhoods due to road closings, and others were unable to leave for work, or even leave their workplace. No injuries were reported, but the fire department has requested caution when venturing outside in case of lingering vapors. Inhalation of ammonia fumes can result in irritation of the respiratory tract, depending on the amount inhaled. Ammonia fumes can be overwhelming; no one can stand to breathe them in for very long. That is why U.S. Chemical Storage offers fully compliant, 100% customizable hazardous waste containers and optional accessories for the highest protection from hazardous materials. A mechanical ventilation system can maintain your hazardous waste container environment by reducing vapors to below permissible levels. Additionally, ammonia is corrosive and a fire hazard. Your hazardous waste containers should take all characteristics of ammonia into account to prevent dangerous buildup of fumes, and climate control can protect your chemical inventory from rupturing in the heat. Ammonia is considered a hazardous material because it is corrosive, flammable, and toxic. 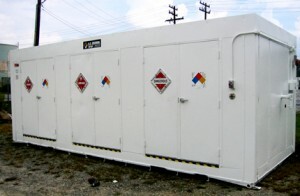 Maintaining a safe space within your hazardous waste containers can protect your environment and community from the adverse effects of ammonia storage. U.S. Chemical Storage can help you design hazardous waste containers specifically tailored to ammonia storage and the hazards it creates.